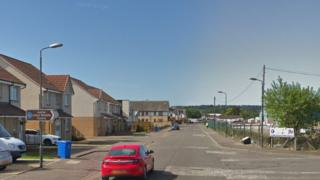 A 43-year-old pedestrian has died after being hit by a lorry in Grangemouth. Gary Strang, who lived in the town, was struck on Wood Street at about 08:40 on Monday. He was taken to Forth Valley Royal Hospital with serious injuries but died a short time later. The road was closed for about eight hours while police conducted an investigation at the scene. Officers have appealed for witnesses to come forward. Sgt David Marr, from the Road Policing Unit in Stirling, said: "Our deepest sympathies are with the family of Mr Strang and our officers continue to provide them with all the support they need during this very difficult time. "As part of our investigation, we are keen to hear from members of the public who were on Wood Street at the time and who saw exactly what happened. "Likewise, motorists with dashcam footage or anyone with any other relevant information should also contact police immediately."